I'm thinking FOX does not want you to see this video! Ben Stein is absolutely correct, it doesn't take an economic genius to figure out that higher taxes are not an option. Everyone wants this country to recover and grow, to produce more jobs and offer better benefits, no one wants to pay the piper. the drawing board, lose the failed economics and begin a fifth economic cycle based on American based substantive production. Conversion of the cities to more use of public transportation, investment in "green" jobs, which only means we convert to more modern uses of fuel, replace the old grids for new ones, repair and replace our infrastructure. Lets' get smart! You cannot currently send a star to Kit because you have done so within the last week. Excellent historical context provided for this story Kit! Thanks so much. I can think of four or five things that would really make a difference but increasing the rich's taxes isn't one of them. I've stated them before so I'm not going to reiterate. Those elitist puppies have got more hidyholes than you can imagine so raising taxes just make Warren Buffet and the gang smile because they will still pay less tax than their adminsitrative assistants. 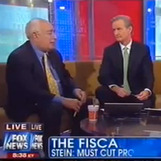 I respect Ben Stein's opinions. One could tell the Fox people weren't happy with his comments. You cannot currently send a star to june because you have done so within the last week. Noted. The tax rate & loopholes for the wealthiest have been greatly disproportionate far too long. When someone making $50,000 yr. pays more taxes than someone making $5 million & more, the deck has been stacked, the game rigged & the system broken. The Sequestration both parties agreed to last year, is now being threatened by both parties, as the GOP is pushing to keep those tax cuts and Pentagon funding. We're going to have to pay close attention to that "Grand Bargain" both parties are trying to pass. We mustn't let them pull the wool over our eyes and steal our home mortgage deduction, either. You cannot currently send a star to Lois because you have done so within the last week.